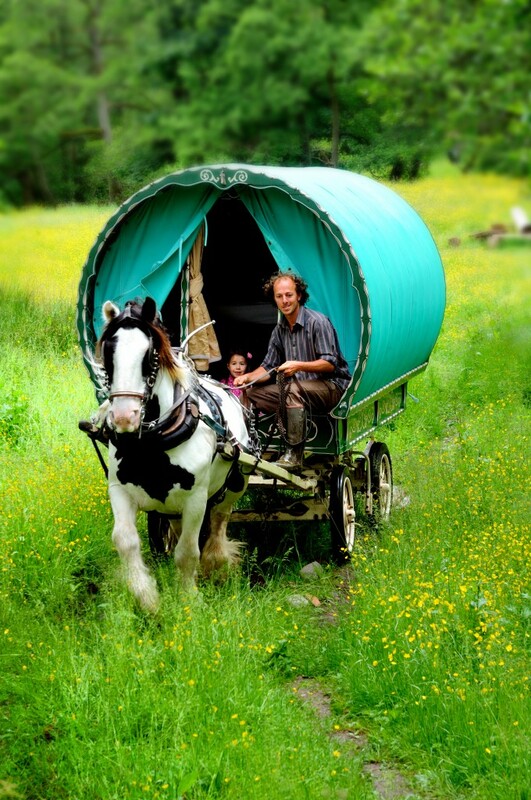 Wanderlusts gypsy caravan holidays are a unique way to enjoy an adventure holiday. Travel in a traditional horse drawn bow top gypsy caravan (vardo). 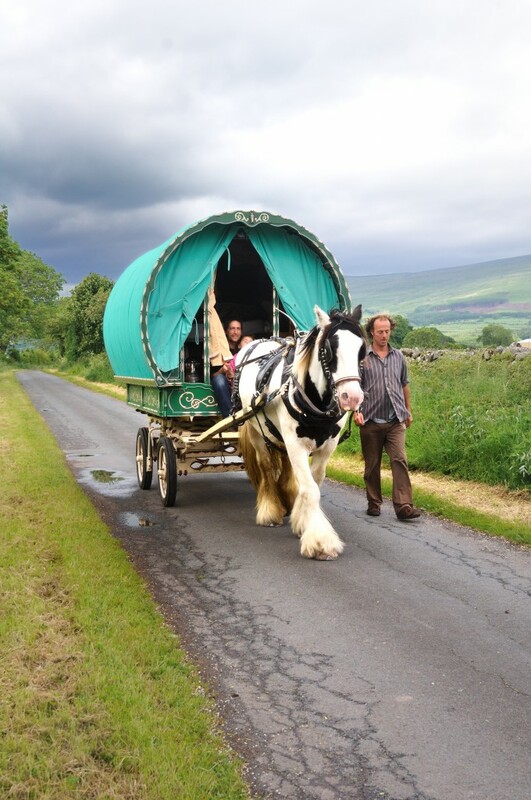 If you are looking for a relaxing place to stay with an adventure along the way, to be surrounded by the peaceful and charming countryside of Cumbria and slow down to the easy pace of our gentle giants. 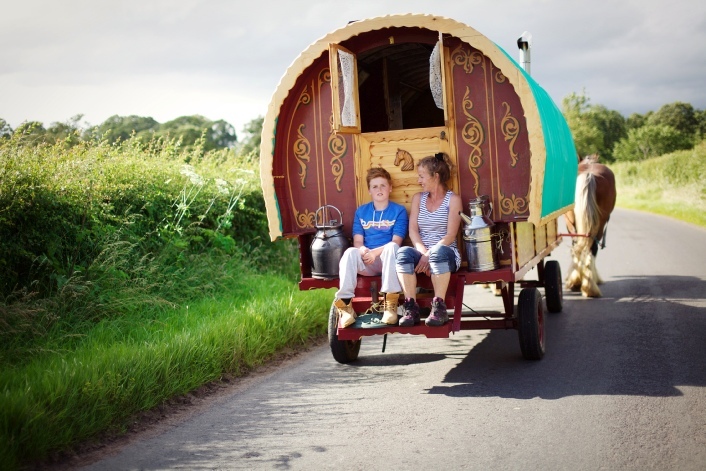 A gypsy caravan is a great way to spend a family holiday, to escape as a couple or enjoy the experience with friends. It’s been proven as a great option for hen parties also. 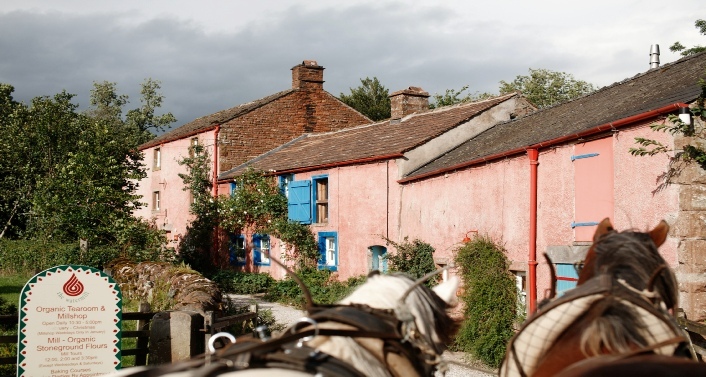 You may have the opportunity to take the reigns and drive the horse and wagon along quiet country roads, after some instructions but we’ll always be near to hand so no need for any experience or worries. We take you from one beautiful camp to the next. 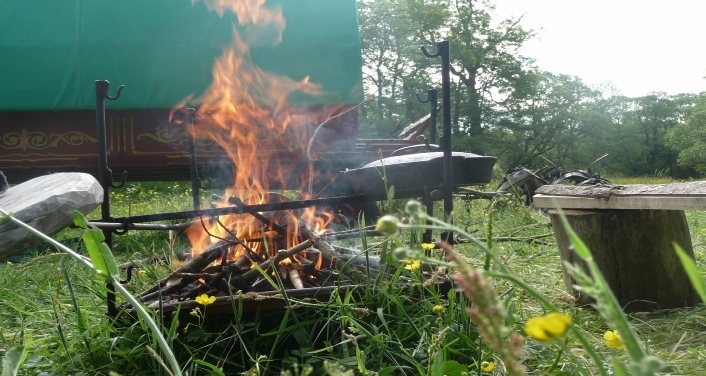 We set you up with a fire and all you need before leaving you for a night or two to enjoy your privacy, nature and adventure holiday, before returning to yoke up the horse and trundle on to the next camp..
What we are offering is a totally unique experience, the chance to touch upon a childhood dream! to be transported slowly and gently to the romantic ideals behind stories such as ‘The Wind in the Willows’ and ‘Danny the Champion of the World’ and so many more…. A big part of ‘our place’ is on the road. 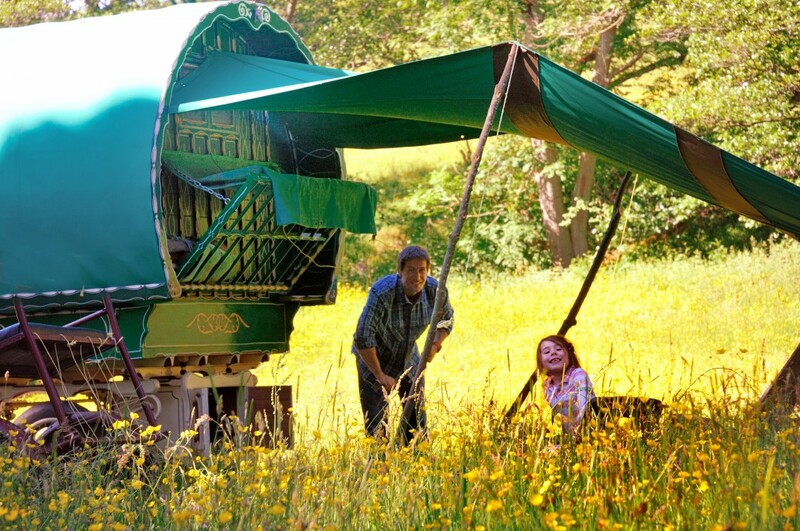 We have specifically chosen our camps in wildflower meadows, and private fields with streams flowing fresh from the hills . 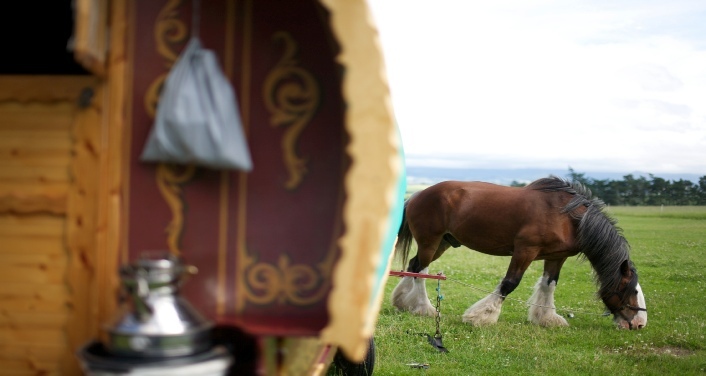 You can choose to stay at a camp in a static gypsy caravan or enjoy the horse drawn travel from camp to camp each day. This is a truly magical way to spend your holiday and memories will last a lifetime. “Hawthorne Hollow” is an old farmers quarry, from where they would have taken stone of which the dry stone walls surrounding the fields around here are built. Quarries such as this were once the traditional stopping places for Romany travellers and itinerant workers who would camp here whilst doing seasonal work on surrounding farms and such like.. A small stream meanders its way by the camp, ideal for paddling and collecting water for washing. Here you can relax by the fire and watch the lively bird life in the trees,or perhaps see a deer or badger. There is a compost loo . There are some lovely walks from each stop. The idea of this experience is to enjoy things at a slower pace and enjoy the peace of the countryside… customers require a certain level of fitness as on hills may be asked to walk at times.. you also may need to carry and refill the water container, and gathering firewood is all part of the experience, although some will be provided. We can provide roadside and fireside meals on request, please ask..
We’ll also instruct them how to look after horses ,e.g. brushing and watering etc.. 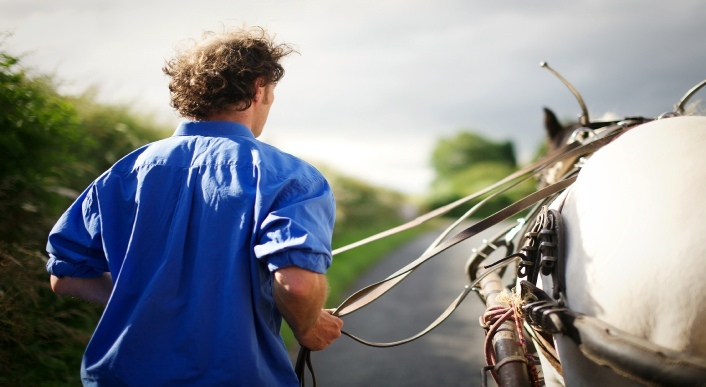 Please travel light and keep in mind the horse will be pulling you the wagon and luggage! The Gypsy Caravan is mostly made of wood, lined on the inside with a warm and regal fabric , then a layer of felted wool insulation and covered in traditional canvas, the wood work has quite a lot of carving, not only for beauty, but this also reduces the weight dramatically, which makes a big difference to the horses when pulling!! double bed(with bedding) plus sleeping mats for children(or adults)for which we ask you to bring sleeping bags/bedding, gas hob, kettle fry pan pots cups plates cutlery, wash bowl, cupboards, bay window and stable door. Water container. towels not provided. For anyone unsure about fires, I’ll be happy to give help. Shower heated on the fire. There will be a wash bowl to have what we called on the circus “a dry shower” or flannel wash..(flannels not provided..) water can be heated on the fire or gas. or you can do as I do when travelling and have a soap free wash down in the stream!! Bed linen provided for double, we ask you to bring childrens bedding, but if this is tricky because of how you’re getting here, just ask and we’ll try to sort something out. You may want to bring torches and towels , swim ware for the river ….. We travel every other day so you’ll have the in between days to explore on foot. Otherwise, Please Pack Light For The Horses Sake!!!! We’re in the Eden Valley. Im very sorry but we don’t have any printed brochures. We are a family of 2 adults and 2 children ages 9 and 11 looking to rent a gypsy caravan for 1 week in the beginning of August.